I don't know why I thought this was so funny. People collect all sorts of "action figures". When I was a kid, "action figure" meant GI Joe with the strap-on gun, or that large-muscled stretchy guy that my brothers tortured. Now, however, you can get almost anything in a doll... all sorts of characters from yer favorite comic books and movies. I don't know if these would even be considered toys anymore though. They're "collectibles". Anybody see "40 Year Old Virgin?" What's the value of a Star Wars figure, still in the box, never opened? It's unbelievable, big business. Go ahead, Google "action figures" and see how many returns you get. Well, anyway, to the point. 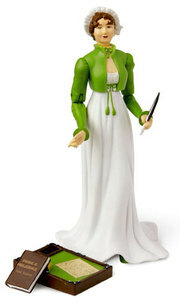 While browsing through my copious catalogs, I ran across this -- a Jane Austen "action figure" from Signals. I wanted to call this a figurine, but I'm not sure that fits. Does a figurine have to be porcelaine? It doesn't say what this one is made of. Well, anyway, here she is, Jane Austen, standing a full 5 1/4 inches tall wearing a frilly cap and a dress much too long to be practical. And what action figure worth its salt would be complete without some kind of accoutrement? This Jane comes complete with a copy of her own book, "Pride & Prejudice", a writing desk and a removable quill pen. You know, as much as I laughed at this, I was almost tempted to get it. Except that she's not very pretty, and there's no tea cup or teapot, and as far as I can find, no options to expand her accessories. I guess I could buy a Barbie tea set and just fake it, eh? Oh, I'm just cracking myself up here. I just saw your post (Oct.2006) about a Jane Austen figure. A few years ago I made a "Jane" sculpture for my writer friend & have been asked to make a standing figure now for someone else. (You can view my first one on my website:(www.lisawalshsculptures.com) This "Jane" is writing while sitting on a rock and was made with white clay and porcelain. It is considered a sculpture instead of a figurine though because of the size. Hey, on April 4th 2006, you posted to my site. Could you update your link then to point to http://www.maths.ox.ac.uk/~pdehaye/chocolate.html ? 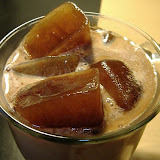 I am in the process of transferring my website.